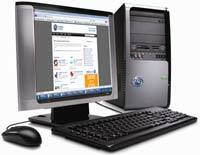 The PC health check costs £95 for previous customers and £105 for new customers. It remains the most comprehensive check of your computer that is currently available in the area. We have been carrying out this type of maintenance for many years and existing customers often ask for a yearly ‘spring clean’ of their PC. It can be carried out as a standalone service or in conjunction with a repair or upgrade. All necessary updates will be carried out provided there is broadband Internet access at your home. Should you be interested in this service please contact us via telephone or email. Details can be found on the ‘Contact us‘ page of this site.